We really did intend for last week to be our last in this series on grace. But then I learned something else (funny how that works!) and I wanted to share in case you've ever struggled with this, too. 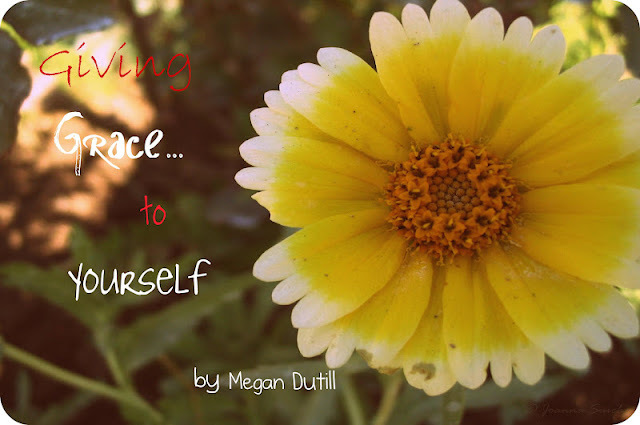 It's about showing grace to ourselves. The scandalous thing about grace is that it's free. It covers absolutely everything we do. And while we have to pay the natural consequences of our sin in this world, the punishment has been taken away. Jesus already died to pay it. Sometimes I have a hard time coping with that. So I punish myself. God can forgive me, but I won't forgive myself. And I'm so busy punishing and hating myself and not forgiving that I can't even how wrong this is. Saying God can forgive me but I won't forgive me is, quite simply, setting myself up to be a higher authority than God, no matter how humble or right it feels.